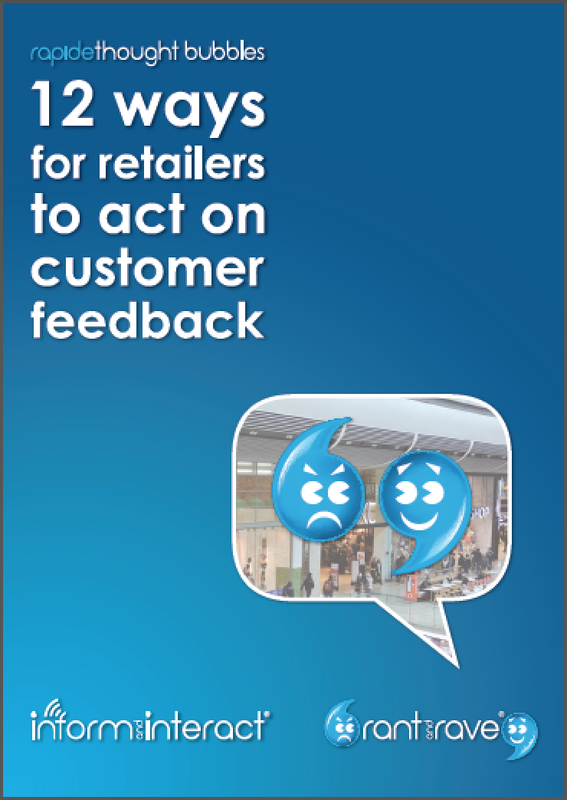 Retailers are expert at collecting responses from customers: the in-store questionnaire, the web survey, the focus group. But in today’s connected world – where a single Tweet can reach millions and one media story can colour people’s views forever – do such methods give the whole story? Technologists Rapide used two tools to explore this question. One a multi-channel short code (66099) that shoppers could call, text or send a picture message to in order to share their thoughts about any brand. Two, the Rant & Rave natural-language sentiment engine to collect and analyse this spontaneous customer feedback. (Here we study feedback collected in a single day at several London retail locations including Oxford Street and Westfield Stratford.) The sample ran to over 1,000 discrete utterances containing several thousand data points of interest. Using standard statistical methods, this Thought Bubble explores how even a small number of off-the-cuff comments can – if they’re made without the constraints of a formal survey – deliver genuine customer insight. Equally important, how they can turn abstract ideas into quantified business value according to well-known retail metrics, including sales/sq ft and street footfall. Based on this work, Rapide concludes freeform, natural-language customer feedback has immense value for today’s retailers.